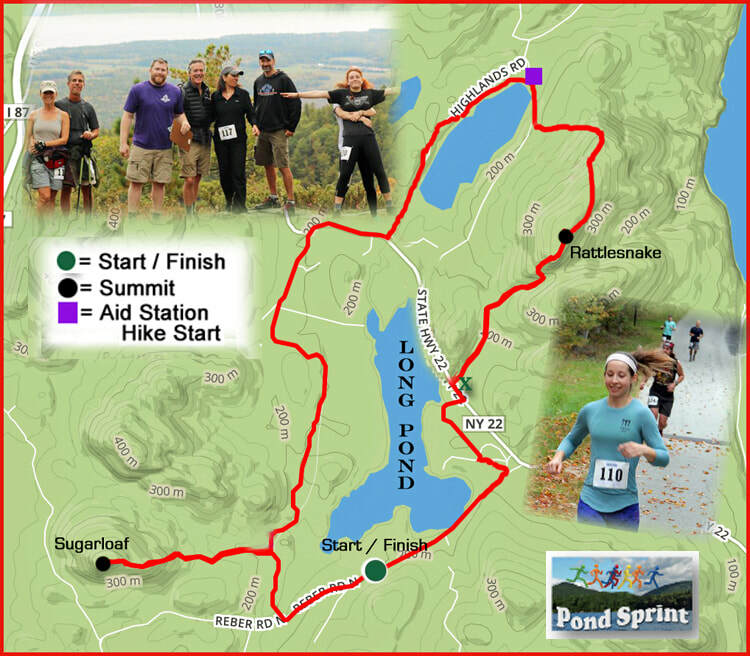 The POND SPRINT will begin at the Pok-O-MacCready Conference Center (0.0) and follow Reber Road southwest - and downhill - to the trail around Long Pond (White's Road) at the 6/10 of a mile mark. At the 1.2 mile mark, participants will leave White's Road and take an out and back trail to the summit of Sugarloaf mountain (one mile, +/- 752 vertical feet each way), returning to the junction at 3.25. The next portion of the route, wholly runnable, will continue along the western side of Long Pond, reaching Carver Road at 4.6. BEWARE OF UNLEASHED DOGS on this dirt road, which will end at NY Route 22 (5.5). Here, racers and walkers will have their only major road stretch, less than half a mile. RUNNERS SHOULD CROSS ROAD TO FACE TRAFFIC AS SOON AS POSSIBLE (there will likely be no road assistance). At 5.9 miles, the course will turn north on to Highlands Road, following the dirt road until reaching the farm at Burnham Way (7.2) The only aid station is located here. Access from this point, to the summit of Rattlesnake, has been granted with thanks to Highlands Forest, LLC. The route crosses a farm field, enters the woods on a trail, prior to turning onto a tote road, which leads to the top of Rattlesnake (8.9), having climbed 682 feet since leaving the aid station. From the summit, the route follows a course familiar to Patch Sprinters, descending the mountain, and returning to the finish line via Beaver Road (10.3), the 1812 Homestead (11.0) and Reber Road, finishing at the start/finish line at Camp MacCready. There will be one aid station (see above), although runners are strongly encouraged to carry, or stash, their own supplies, and account for their own garbage. There will be selective marking arrows on the course, at areas deemed to be necessary. The POND HIKE is a 4.75 mile course covering much of the last section of the Pond Sprint. Hikers will begin at the Highlands Road aid station, climb up 1.75 up Rattlesnake, and return to Pok-O-Maccready via Beaver Road, the History Trail, the 1812 Homestead and Reber Road-- following the same final 4.75 miles as the Pond Sprint. Participants in the non-competitive division are free to run, jog, hike, walk or stroll at whatever pace allows them to enjoy the beautiful fall foliage of Long Pond. Shuttle service will be provided to the starting point.